often derived from poorer sticky subsoil or where the top soil is shallow over heavy subsoil. MM02 is a medium to tall mix suited to any moisture retentive sticky soil. It will perform even if the clay dries out. This mixture will grow very well on old well worked clay soils or new gardens with builders clay compacted after the builders have finished. Ideal for nutrient improved acidic gley, clays and daub basic soils. On clay soils, after an initial cleaning of the seed bed, weeds and grasses may re-invade, wait a few weeks and clean up the weeds again. This mixtures contains 1% native grass seed harvested with The Yellow Rattle, 1% grass is so little you will hardly notice it, the grass acts as a host for Yellow Rattle. MM02 needs careful attention to secure a meadow. 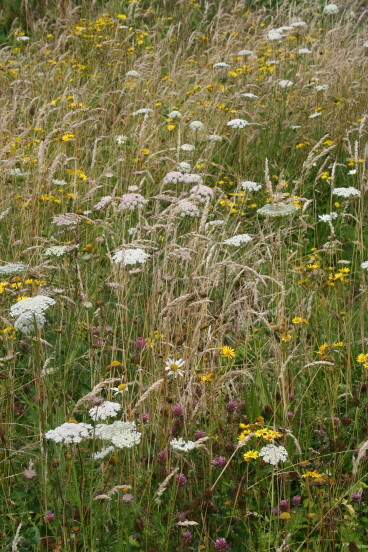 In the second or third year, do not let the wild grass present in your soil out-grow the wildflowers, cut the meadow back to 12 -16 cm and remove the cuttings. Often Clay soils tend to be fertile, even when you think it's not (yellowing grass can be a sign of cold weather or poor drainage and not poor fertility), to control rampancy the meadow should be cut in spring and late July or August and if you have the time again in Autumn. Always clear the cutting and do not let any more fertility build up on clay soils. MM02 will be at its best between July and September. The tall Meadow Buttercup will provide great spring colour to start the season Do not confuse Meadow Buttercup with Creeping Buttercup, which is not included, but may be present on many a clay soil. Cut the meadow just before the Creeping Buttercup flowers, if the problem gets worse over-sow the meadow with grasses to control infestation of creeping buttercup. Moisture Level: Not for very dry soil, best suits normal, moist heavy clay.. Fertility Range: Will grow on any soil. Soil Preparation: May be difficult on clay soil. create fine tilt on seed bed, press the seed into clean soil. Optimum Sowing Time: Late spring, early autumn, when the soil is warm. Sowing Conditions: Clay soil will be difficult to sow and rake. roll, press or rake into surface to keep out of reach from birds. Sowing Method: By hand is recommended, if using seed spreaders be careful to insure the small varieties of seed do not drop to the bottom of the seed spreader and get sown all in the one place. Can be Hydrasown. Seed Sowing Rates: 1.5 grams per metre. In normal conditions (mainly in early Autumn and Spring) this mix should germinate 4 - 6 weeks after sowing, from then on, provided the sward is kept open and a 'Thatch' is not allowed develop, species will continue to germinate and emerge, through to the third year. First Year: The annuals will flower profusely, provided they are sown before June. They require one cut when finished flowering. If the native grass seeds present in your soil grows vigorously, the meadow will require two or three cuts in the third year, the first cut in Spring (April/May) to no lower than 12cm and the second cut in July or August, to now lower than 15cm, the meadow can again be cut down in September if the grasses are still growing strong. In the fourth year, when the perennials in the mixture should be flowering on many stems and starting to clump and spread, again if grass is still vigorous cut in spring and in August of the fourth year. However if the perennials are growing strong there will be no need to cut until July, August or September depending on the fertility and wetness of the soil and the species which have grown. Tolerance of Cutting: High tolerance after second year. Management: Control grasses and weeds until well established. Accept any normal non-invasive weeds in first year as they provide cover, once the sward is established, digging, spot spraying or weed wiping can be used to eliminate problem species. Control weeds, especially Creeping Buttercup, if Creeping Buttercup is present cut this meadow in May in year two. The third year is the critical year to maintain this meadow as scutch grass, creeping thistle, nettle and dock will try to dominate as the growing conditions are ideal for such unwanted species.